PGA Pro Tour member Bubba Watson has an easy name to remember. And after his exciting victory in yesterday’s Farmers Insurance Open in San Diego, his name will be even harder to forget. LAYING IT UP: Bubba Watson let it all hang out yesterday on his way to a one-stroke victory over Phil Mickelson at the Farmers Insurance Open. Upper Deck has his first licensed trading card on the horizon. The 32-year-old from Bagdad, Florida, bested a competitive field of 155 other golfers on his way to a single-stroke victory over fellow lefty and hometown favorite, Phil Mickelson. After posting a final round score of 67 (five strokes under par), Watson had outdueled the best of the best on an overcast, drizzly day at Torrey Pines South. 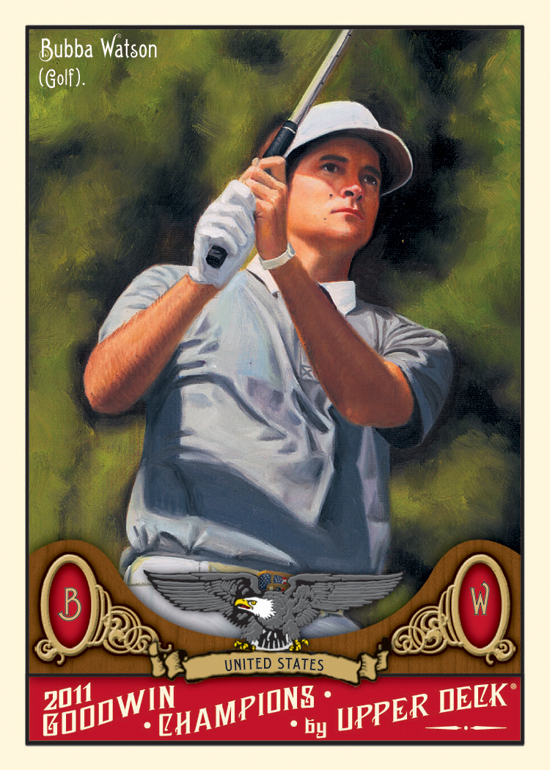 And the really cool thing about Bubba is that he has his very first licensed trading card appearing in Upper Deck’s 2011 Goodwin Champions set that’s scheduled to release in mid-June. The launch date just happens to coincide with the 2011 U.S. Open, which Watson should be competing in at the Congressional Country Club in Bethesda, Maryland. Although we had Bubba on our trading card radar last year, it wasn’t until he reached out to us on Twitter that we got even more serious about making the relationship a reality. Yesterday’s PGA Tour win was just the second in history for the lanky, 6’ 3” linkster. After missing the cut at last week’s Bob Hope Classic, and finishing tied for 25th in the Hyundai Tournament of Champions on January 9, Watson put together four impressive rounds of golf at Torrey Pines (71-65-69-67) totaling 272. A 12-foot birdie putt on No. 18 was the deciding stroke as runner-up Mickelson needed to hole a wedge shot from 72 yards out in order to force a playoff, which he nearly wound up doing. Watson is expected to have autographed cards in another Upper Deck set later this year: “Ultimate Champions.” In the meantime, keep your eyes peeled for the 2011 Goodwin Champions release. It will be here before you know it.